Cable trunking is a hollow enclosure through which cables can be run to keep them protected and organised, with a removable or hinged side allowing quick and convenient access for routine inspections or wire changes.You’ll see cable trunking used most conspicuously in office buildings, usually as a white plastic outcropping that runs along walls adjacent to computer terminals and other electrical appliances. This widespread use has given rise to the common assumption that cable trunking is for commercial rather than residential use. In reality, it can perform an instrumental role in keeping your cables protected while safeguarding you and your family from harm and your property from damage. Without cable trunking, water hazards pose a greater risk, electrical fires are more likely, and the chance of suffering a serious electric shock rises. What Types of Cable Trunking Are Available? PVC: By far the lightest and most affordable material, PCV cable trunking can be made in various thicknesses to suit varying applications, and it resists moisture and corrosion extremely well. It is also non-conductive and possesses a high thermal coefficient of expansion to allow for expansion and contraction – both qualities are clearly useful in conjunction with electric wiring. The downside is that it isn’t particularly tough, but it still works well in most residential settings. Steel: Often used where durability is paramount, steel trunking is remarkably strong and yet heavy and inflexible. The price is relatively low, but steel’s weight and its ability to rust make it little used for residential cable trunking. Glass Reinforced Polyester: Still cost-effective, glass reinforced polyester is fire retardant and self-extinguishing, making it excellent in hazardous areas. It even boasts anti-corrosive properties. Galvanized Rigid Conduit (or RMC): Made using galvanized steel tubing to resist corrosion, this is a thick and tough metal often used in commercial and industrial applications. Recent cost reduction and a spreading awareness of its longevity have seen it used more widely in residential construction, though the price still puts some people off. Regardless of the cable trunking you use, you’ll chiefly be using it to protect yourself against water-damage, fire, and electric shocks. Before this article comes to an end, we’ll have covered each risk factor, detailing the dangers involved and how cable trunking can make a difference. Contrary to popular belief, water itself doesn’t conduct electricity. Instead, it is the impurities suspended in water, such as minerals and dust, that conduct electricity; engineers can actually use water stripped of impurities to cool high voltage equipment. But any form of water your cables could encounter will be suffused with impurities and perfectly capable of electrical conduction, and several problems can arise when water and cabling meet. Rust and Corrosion: Copper wire is often wrapped in paper, which can absorb moisture if exposed, resulting in rust. Alternatively, internal wiring components can corrode, leading to possible insulation issues and termination problems. Fire: Moisture can increase the current running through a circuit. If the fuse fails to blow, enough heat can be generated to start a fire. Even a small amount of moisture can accumulate salts if wiring regularly conducts electricity. This increases its ability to take a current, eventually resulting in dangerous levels of overheating. Damaged Hardware: Water damage can cause spikes in power and intermittent power delivery. Hardware and appliances can be damaged through unexpected surges. Injury or Death: Most importantly, your body, itself rich in salts and water, can become part of the electricity’s path to the ground if you touch water that is conducting electricity. Serious injury can occur as a result, and accidents often prove fatal. 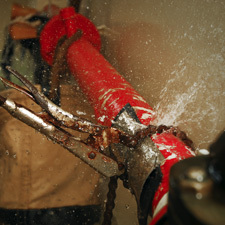 When water meets cables, you risk complications as diverse as increased risk of fire and serious injury. 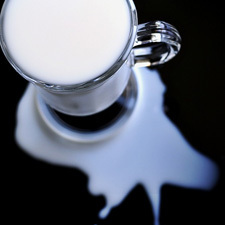 Even worse, issues can develop slowly, finally manifesting weeks or months after the initial wetting. These are hard facts that underline the need for proper cable trunking. Here’s a quick overview of key areas of concern and how to address them to eliminate as far as possible the risk of water-related damage or injury. As clarified above, water and electricity do not mix well. 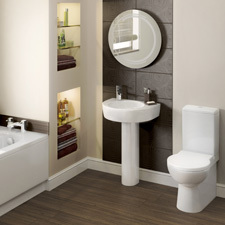 In bathrooms, kitchens, shower rooms, and any other room in your property where water is going to be used in abundance, you’ll want to minimise the number of cables present. Of course, that’s not always possible, especially in an appliance-heavy room like the kitchen. But you can still mitigate the risk of damage or injury by utilising the right trunking system. You’ll want your cables to be completely covered. Avoid any ventilated cable trunks, and make sure a watertight seal is created when you close them up. Remember, it’s water vapour as well as liquid water that can penetrate. You’ll want to use a well-insulated plastic instead of metal to prevent condensation forming along the inside, and it only makes sense to check for signs of moisture on a regular basis. The bathroom, shower room, and kitchen are the usual suspects when it comes to water-related wiring issues, but there are few rooms in your home where you won’t sometimes want to enjoy a glass of water or a mug of tea. Spilling even a few drops onto an exposed wire could cause problems, but trunking can provide valuable protection. 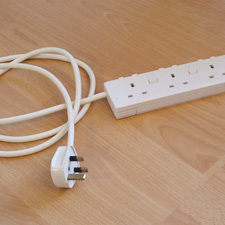 Trunking is particularly recommended when lots of wiring is used in the same place since exposed wires are more common and water will be harder to dry up – any spills that aren’t dried up immediately can leave residue across the cable, causing it to stick to other wires and heat up more readily. If cabling is submerged for more than a few hours, it will almost certainly need to be replaced – as well as catastrophic water damage, floodwaters will have sullied the cabling with other dirt and debris, significantly impairing its ability to operate safely, if at all. That said, cable trunking can still be advantageous. 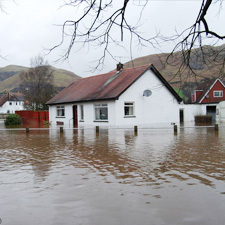 Floodwaters may not reach high enough to affect your wiring, in which case replacements may not be required. If you live in an area subject to frequent flooding, think about installing dado trunking – it is mounted horizontally about midway up the wall, helpfully rising your cabling while also keeping it secure and organised. 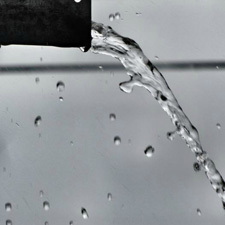 Prevention is always key when it comes to burst pipes, especially since pipes often run close to cabling. If you fall victim to a burst pipe, turn off the electricity immediately and seek out the services of a properly qualified electrician as quickly as possible. As with flooding, using cable trunking can significantly reduce the likelihood of needing to replace your entire cabling system. Remember, even minimal exposure can lead to corrosion. Most people only think to employ trunking along the wall space that’s immediately possible. This can indeed protect cabling from water in the event of a burst pipe, but it’s also vital that cables running behind your walls or within your attic enjoy protection. You’ll safeguard them against moisture issues, and you’ll remove the risk of sudden overload if a pipe should burst directly over your cabling. Though grave problems can arise, the vast majority of water-related cable damage will prove inconvenient instead of disastrous. When we examine fire-related cable damage, things became far more serious. Each year, there are over an estimated 20,000 electrical fires started in homes across the UK, and improper cabling is one of the most common culprits. Even the most insignificant spark can develop into an inferno, setting alight everything from expensive electricals to treasured family keepsakes, and the flames and smoke can put the lives of you and your family in jeopardy. 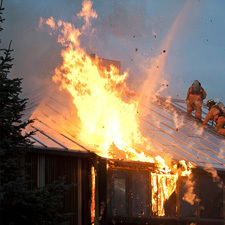 Even if the fire is only small, the cost can be huge and the repairs time-consuming, invasive, and drawn-out. Cables can create fires themselves or suffer damage from a fire started by other means. As such, cable trunking assumes greater importance by protecting from internal and external heat and flames. Outlets are put under more strain than electric cables, but using trunking can reduce the risk of damage. If you don’t use trunking, it’s likely that your cables will be pulled this way and that or become bunched up and rest at an odd angle. 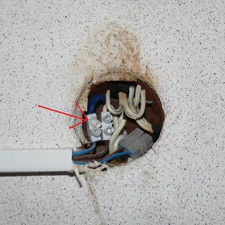 In any case, the strain on the outlet can cause it to loosen – you may notice that plugs that once had to be firmly pushed in now slip in without argument. At this point, the outlet needs to be replaced to remove a fire hazard. If any faulty outlets do begin to spark, those sparks will extinguish themselves against the interior of the trunking instead of sinking into carpets, furnishings, or upholstery and potentially starting a blaze. Outlets can loosen thanks to several factors, but mismanaged wires are certainly one of the most common causes. Grouping your cables together and seeing that they are prevented from taking or creating any strain goes a long way towards protecting your outlets. Light fittings summon up high voltages and can project sparks over a considerable area. However, few wires are needed, so thin trunking can be used on either side of the ceiling to ensure that the cables stay in good order. Extension cords are so popular that most homeowners don’t even give a thought to how to use them safely. Granted, modern extension cords tend to be fitted with dedicated fuses and surge protection technology, but they should only be used when necessary since wiring can easily be damaged. Cables might seem tough, but when one is stood upon or rolled over, the electrical resistance starts to fail and the inbuilt insulation gets damaged. As this process continues, more and more current will flow through the cabling, possibly resulting in a fire. This is particularly likely when the extension cord extends under a rug or large piece of furniture – it will heat up more easily and be walked over more often. You don’t have to ditch your extension cords, but you should make sure they are only used when necessary. Where possible, adopt cable trunking instead. It can go around the entire perimeter of a room to provide multiple outlet points while still keeping its cabling safe from harm. Most homeowners are guilty of letting their cables bunch up and tangle together. It’s easy enough to do; you might, for example, have cables for the TV, DVD player, games console, Sky box, and speaker system all hooked up to the same set of outlets. With power cables and input cables all jostled against each other, problems can arise. Every device you plug into your outlet is going to run at a certain voltage, which is why thick rubber is required to insulate against the heat. However, heat can build up to unsafe levels if cables are tangled together, a risk made riskier by the fact that most bundles of wires are crammed into tight spaces. 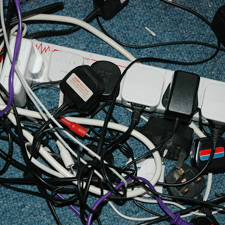 Additionally, poorly arranged cables can rub up against each other to fray or loosen, exposing their hot metal centres. Finally, dust can build up within a tangle of cables, and this can cause safely issues around your outlets. Cable trunking will keep your wires perfectly separated, and you’ll be able to choose wide diameter trunking to maintain plenty of cool air around your cables for safe operation. The modern home seems to depend on electricity just as much as it relies on walls and roof. A burgeoning number of electrical appliances and systems has seen energy usage soar. Luckily enough, safety has been advanced in-step with these developments, and yet there’s no denying that more electric appliances and systems creates more opportunities for electric shock. Such shocks can bring life-changing or life-ending results, as well as possible property damage, so it’s extremely important to protect yourself and your home. Doing so is relatively easy, and cable trunking is one of the most vital safeguards at your disposal. Before understanding how to protect yourself from shocks, you need to evaluate how your electric appliances can create potential hazards if not adequately protected using cable trunking. With that in mind, here’s a quick rundown of the most common appliances. Television: Modern televisions produce little heat and use extremely sophisticated electronics to protect against potential shocks. The problem is that a television’s wiring often comes into close contact with wires from several other sources, and regular adjustment of the viewing angle can abrade those wires. Protecting them within trunking provides space to breath, room for movement, and reduced friction. 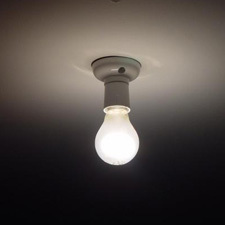 Lighting: Lighting fixtures use relatively high voltages and are often changed by hand, and using oversized wattage lamps in enclosed spaces could cause serious damage to poorly housed cables. Washing Machine: Washing machines produce a huge amount of heat, and they often move erratically during normal operation. Added heat and harsh movements can place considerable stress on unprotected cables. Fridge: At first thought, the fridge would seem relatively impervious to electrical trouble. In fact, most models incorporate highly flammable gases and materials, so even a small electrical issue can prove serious. Fridges also hide their cables, and the fact that those cables are often left unprotected across out-of-the-way flooring allows them to collect dust and get chewed on by pests. Most electric systems incorporate live, neutral, and earth wires. Of these, the live wire is the most dangerous since it is responsible for carrying current to your appliances at high voltage. A fault in the wiring system can cause the live wire to carry excessive current, which can overheat the fuse and break the circuit. 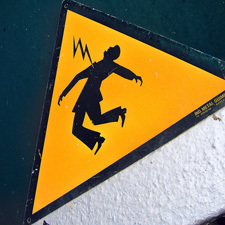 If you touch an exposed live wire, you should receive a nasty electric shock as the current passes through your body. 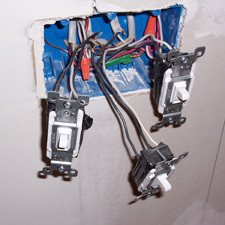 Wires need to be protected from damage to prevent the live wire becoming exposed. 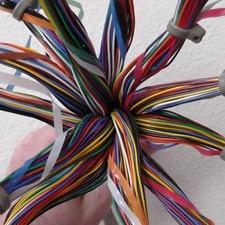 Wiring systems that are not housed within cable management systems are more likely to take bumps and knocks, and they might be respectively pulled at or chew on by young children and animals. Cable trunking is vital – it reduces the risk of live wire exposure and makes accidental contact unlikely. Cable management dramatically enhances household safety. Cables are run along a flexible casing to keep each one in good condition and free from avoidable stresses. At the same time, you’ll smarten up the appearance of your home, removing the pell-mell appearance associated with exposed wiring. Trunking represents a low-cost solution that blends perfectly with your furnishings and requires minimal ongoing upkeep. Beyond poorly-organized wires, a variety of electrical dangers are present in the average home. Walls and partitions often conceal electrical cables, creating danger when you need to drill in screws or hammer in nails. Fuses, outlets, and plugs can often be wired incorrectly. Trunking tidies up the layout and safeguards against the complications of poor wiring, but remember that a qualified electrician should be consulted if you notice any signs of electrical problems.